a little something for my pagan readers | Lunar Camel Co. I would love to recreate this shop as some sort of installation. 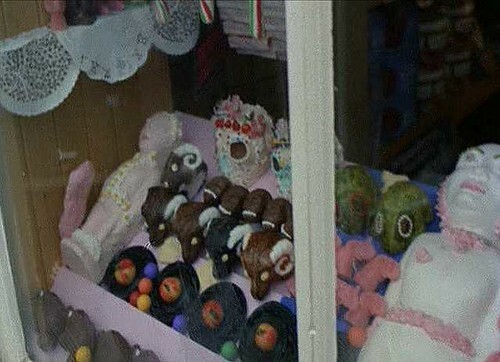 This scene in the film was shot on location in Kirkcudbright, Scotland and May Morrison’s shop is now an art gallery. I can’t help wondering if they ever put a chocolate toad or two in their window. Small frog molds are easy to find but one needs nice fat toads to do this right. 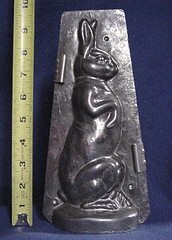 Likewise, finding a hare-shaped mold is a little tricky. The Easter bunny is a popular guy and the hare’s long ears and lean body give him a look that’s slightly too feral for blending in on that holiday. It looks like the original Easter bunny was a hare — sacred animal of the Teutonic goddess of spring, associated with fertility — but, similar to the way Mickey Mouse’s appearance changed, the rat-like snout becoming more bulbous and less pointy, the eyes rounder and less beady, the head larger and more toddler-like, the lean, fast-moving hare has become a big-eyed, floppy-eared bunny. This mold from Bittersweet House is more hare-like than bunny-ish but it’s single-sided. 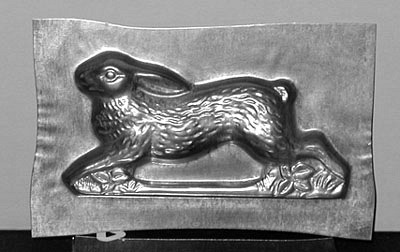 This place seems to have a good selection of antique molds, including at least one nice big hare, and although they’re not advertised I see a very promising toad and a fish on the wall there. We’ll need babies too. 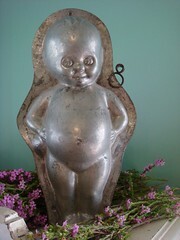 This great big 1930s kewpie doll is perfect, a dead ringer for the chocobaby in the window, but it’s $375. 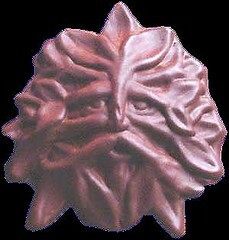 I don’t suppose any of you happen to know of an organization that gives grants to pagan candy-makers? 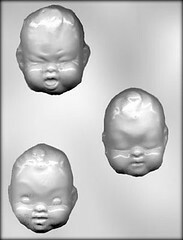 Grafting these suitably-anguished faces onto a more generic kewpie body might work. I’ve also got my eye on this mold, which is a relative bargain at $150. The same seller also has a nice fish. A reasonably-large turtle mold is easier to come by than I thought: this one makes a 5 1/4″ turtle and it’s under $3, and the same supplier has elephants similar to the pink ones in May Morrison’s window. The pigs are more difficult to match but I like this seated one, and it looks like it’s a sturdier mold than the clear plastic ones. (Pricier too; it’s $27, but it makes a nice big 6 1/4″ piggie). As for flavoring the chocolates, the first thing that comes to my mind is a corn and barley ganache. One of the most memorable songs in the film for me was the one that goes “Corn rigs and barley rigs and / Corn rigs are bonnie . . .” (based on a ballad by Robert Burns). The great thing about ganache is that it’s a mixture of chocolate and cream and you can infuse cream with the flavor of pretty much anything you can fit in a saucepan. So, using the same technique I relied on to make a chamomile crème anglaise, one could make a sweet corn and barley ganache. (That link is to my food blog; I thought of giving this post a home there instead but somehow it feels like a more like a Lunar Camel Co. project). Simmer sweet corn, toasted barley or barley malt powder in cream, strain it and voilà, infused cream with no revolting niblets or grainy bits in it. Meanwhile, in another pan, we’d also have to infuse more cream with smoked hay. 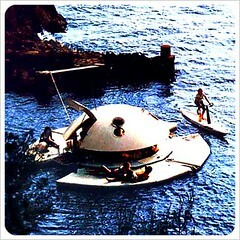 (The reason will make perfect sense if you’ve seen the film; if you haven’t, I don’t want to tell you why). There was a restaurant in D.C. that had a smoked hay sauce on the menu for a while and I don’t think it would be difficult to capture the flavor; a stovetop smoker and some organic hay ought to do. One would also need pink chocolate for the elephants. You can buy it in bulk for $3.79/lb. but it’s got partially hydrogenated palm kernel and cottonseed oils in it, and it would be much nicer to flavor and tint a basic white chocolate (sugar, cocoa butter, and milk) with natural ingredients. The most appropriate choice would be preserves because the residents of Summerisle export all their fruit and vegetables. Remember when Sergeant Howie tries to order an apple for dessert at the inn (after his dinner of turquoise tinned broad beans) and has to settle for canned peaches instead? A terrible restriction in terms of meals but in terms of candy-making the possibilities are not at all discouraging; how about if the elephants were to get their pink hue from a puree of preserved sour cherries? I saw some nice-looking ones in a Hungarian grocery recently and I’ve been trying to think of a reason to go back for them . . . more than one reason, really, because they come in a gigantic jar. I suppose I could spoon them over ice cream but pagan candy-making is much more tempting right now. 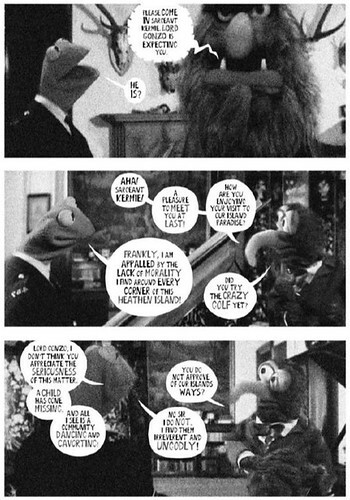 This entry was posted in film, food, video and tagged candy-making, chocolate, comics, Muppets, The Wicker Man. Bookmark the permalink. This is powerful stuff and all pretty far from my areas of expertise. I can chime in though that when Burns says “corn” he doesn’t mean Zea mays; more likely oats. 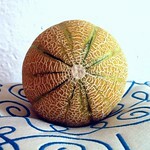 Also it is clear that you need to start making your own molds. Mmm, oatmeal and honey ganache would be great. I *do* need to start making my own molds. Just looked at the stats for my other blog this morning and noticed that someone was searching for a “lunar shortbread mold,” which surely doesn’t exist but needs to . . .
Merciful lord, are you thorough! Very impressed by your thoughts on how to recreate these – and all the pictures, of course. Clearly, I sent that link to exactly the right person. 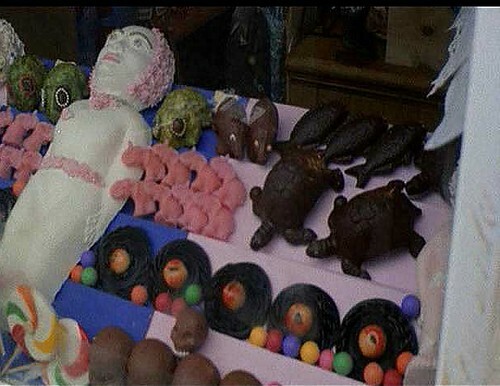 I’ll see if a friend, a true master of baking, will be up for holding a Wicker Man cooking competition. Hmm, I’ll have to have a look through it again to see whether there’s anything baking-related in the film. 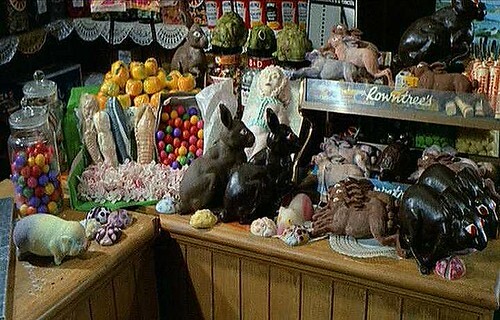 I have a feeling the residents of Summerisle ate only sweets and canned stuff! To me, the ‘black circles with red orbs’ look like they’re supposed to be birds’ nests with chicks or eggs in them. That’s a good guess, thanks Dave. What a great article! You are definitely thorough. 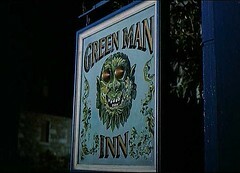 Ah, Summerisle, a Pagan Paradise! Thanks Lady Nightshayde & Susan. Susan I think there’s definitely potential for some crossover considering how dramatically Peeps melt . . . 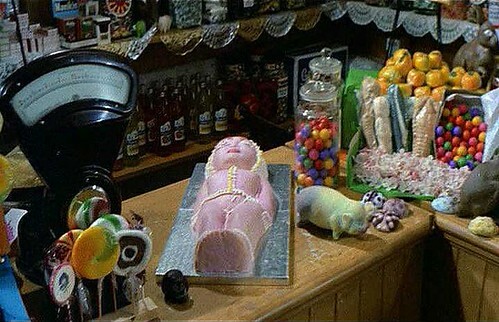 The contents of May Morrison’s sweet shop, aka May’s Tuck Shop in the screenplay, Post Office/May Morrison Sweets in the movie. First we see a chocolate baby sucking it’s thumb standing upright on a shelf on the left. On the far left border a small, what I would call a king cake which I know from the New Orleans Mardi Gras tradition. A pastry baby. In the middle is a large king cake. Fourth row: chocolate scallops? 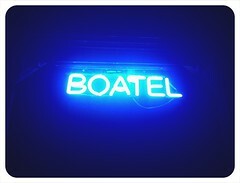 or fish? and lollipops. 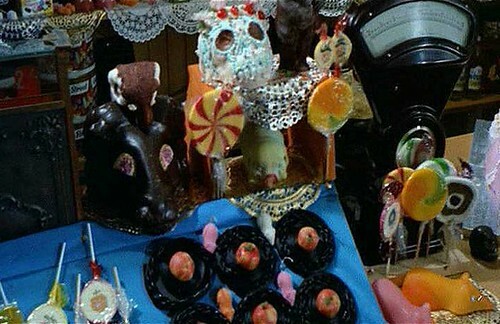 On the right there is a chocolate skull! There might be more chocolate skulls beneath that one. All kinds of flotsam and jetsam you might find in a candy shop but also some chocolate skulls, some lollipops, more apples or peaches with the same wrapping beneath them, a chocolate skull next to the pink king cake. A pig after that. On the adjoining counter, hares abound. 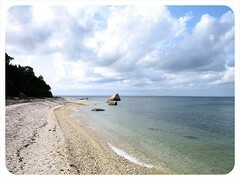 At rest, running. On the level above the main counter are (from left to right): more of those pastry heads, perhaps a pig’s head after the embossed metal box. Above the hares on the adjoining counter: a king cake and a hare and some fish heads above that. An assortment of magnificent chocolate confections met his gaze, as well as curiously lifelike and distended sugar babies. Behind, in glass jars, he could see amazingly large gobstoppers and bull’s-eyes (much more like real bull’s eyes than anything to be seen on the mainland). There are lots of Wicker Man enthusiasts on the Facebook Wicker Man group titled “The Wicker Man (1973)”. One posted a link to this page which is how I found out about it. (Someday, maybe you’ll want to look into what’s in the apothecary shop. There’s a long list of strange contents there too! Hi John. Thanks for a thoughtful & informative comment! I’m not on Facebook but hopefully I’ll be able to have a look at the page anyhow. I remember thinking the wrapping on the fruits was wax paper but now you’ve got me wanting to watch the scene again.